Add orange juice, pineapple juice and coconut water to large stock pot. Stir in orange zest, orange slices, shredded coconut and sugar. Bring a boil then turn heat down to simmer. Simmer for 15 minutes or until sugar is completely dissolved. Strain solids from the mixture using a fine mesh strainer or cheese cloth. Stir Everclear and pineapple syrup into the cooled mixture. Ladle into jar and seal tightly. Store in a cool, dark place for at least 2 weeks before enjoying. See notes. 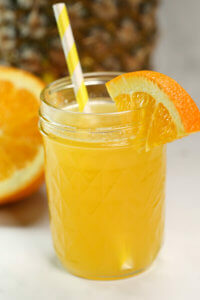 This recipe uses Everclear 190 proof. If you can't find it in your area, you can use Everclear 151 proof or vodka. As long as you alcohol that is more than 80 proof, you can store your moonshine in tightly sealed jars for up to one year in a cool, dark place.